I am a bit too old for Superdry clothes (if you're in your 40's or over...please avoid the huge Superdry logo polo..that's just not cool anymore! ), but I am still a good customer for Fat Face. In fact, year after year Fat Face has become one of my favourite high street shops in the UK. I like the high quality of fabrics used in each piece of clothing, and I really appreciate the stylish casual look of their recent collections. To be honest the feel good vibe and the design of their store is a big winner for me. I already own a lot of boxers and socks from Fat Face but few months ago I received a VIP card to get a free pair of their new range of Organic Cotton Underwear. So I went to my local Fat Face store in Bristol Cribbs Causeway. I chose the Two Pack Rye Stripe Boxer Short in size S. I am a 31-32 in trousers but sizes at Fat Face are always on the big side so a size S fits perfectly fine. In one word: great! Once you put your new boxer on, you really appreciate how soft the fabric is to your skin. As this is made with organic cotton, there are no chemicals and that's a real bonus especially in that very intimate and important part of your body. I like the short length, because I really dislike boxers that are too long. A shorter boxer (trunk) feels much better and enhances more your body...even if you have some extra kilos like me! And let's be honest, a short boxer gives a better silhouette to your manhood which ultimately is probably the most important function of a pair of undies. So I am very happy with the new collection of Fat Face Organic Cotton Boxers. The stripe pattern looks stylish and the great masculine cut and comfort of this garment will impress you! I am amazed that a lot of men don't buy their own underwear, and their wife or partner are in charge of this essential purchase. I can understand it if this is for a gift, but not for everyday use! Come on...follow my advice: You have to buy your own undies....that's probably one of the very few things we have left! 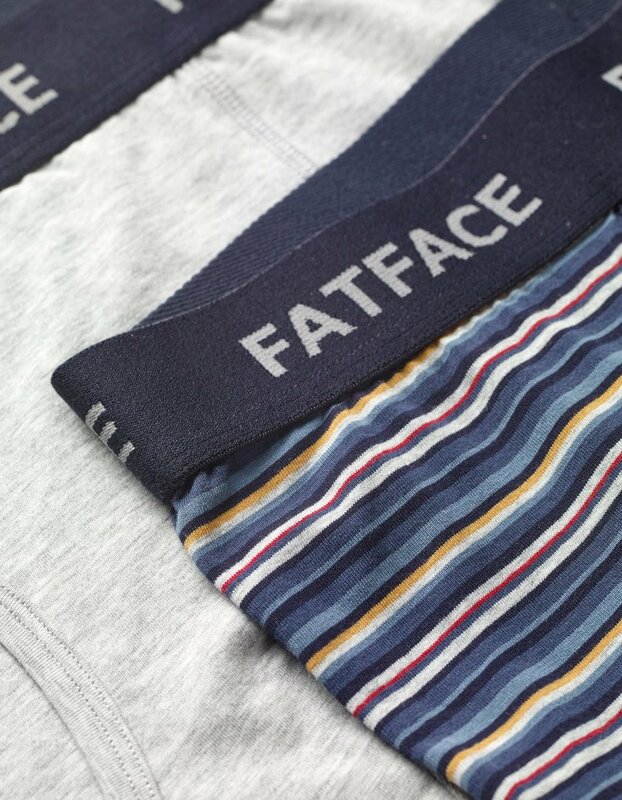 Go to your local Fat Face or order online because the new Boxers with Organic Cotton are really great and at £18 for a pack of two....that's a bargain! Don't wait to have holes in your undies before buying a new pair because this is a huge turn off for your partner. Trust me, there is nothing like the feel of a brand new pair of underwear. I took pictures of myself wearing the Fat Face boxer short. I don't have a "Love Island" body, so I thought this was a great way of showing you what they look like on an everyday over 40's guy! Thank you very much for reading and I can't wait to read your comments.